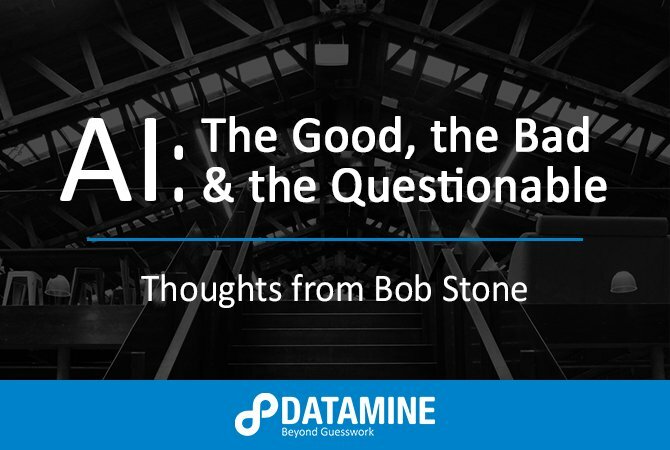 Datamine’s GM of Strategy and Innovation, Bob Stone, is well-versed in the world of artificial intelligence. In his advisory positions at companies including Google, Bosch and CenturyLink, Bob has worked with and been pitched hundreds of AI use cases - some good, some bad and others that fall somewhere in the middle. Here’s his opinion on what makes an AI application good or bad, and what questions we need to be asking to capitalise on this powerful technology while also mitigating the risks it entails. AI has become a buzzword and a mainstream concept that’s no longer limited to movie screen robots and smart computers. There are countless applications across all manner of industries and verticals that have the potential to change the world. So it’s no wonder why everyone wants to do it in their business! In the last few years I’ve had the privilege of working with various incubators, and I’ve been pitched many different AI ideas. While all of these pitches were creative, many of them weren’t what I consider to be a good business use of AI - let me explain. 1. Streamline and automate time-consuming tasks - such as scheduling meetings, proofing documents, updating spreadsheets etc. 2. Open up doors that would still be closed to humanity if it weren’t for machines - like cancer detection, self-driving cars, locating new planets etc. At Datamine, before we take on any new AI projects for clients, we ask ourselves, “Will this be great for society?” This question has two components - will this AI project solve an actual common problem that needs to be solved? And will it do so in a way that is ethical and can’t be used for evil? If the answer isn’t ‘yes’, we look for other ways to help our client through non-AI applications and methodologies, such as through predictive modelling or automation. I believe this, and Datamine believes this - we’re excited to be involved in the development of innovation and AI in New Zealand. Get in touch with me today if you want to connect and discuss collaboration opportunities. Bob boasts an impressive history of BD and Strategy positions and is also a founding member of the New Zealand Innovation Nation, a group dedicated to making NZ the Southern Hemisphere’s innovation hub. Bob’s greatest passion is connecting with people, and he’s excited about sharing the transformative power of technology and analytics in his role at Datamine.